We appear to be in the house of the dead birds. The upper floors here have a lattice of brickwork over them, to reduce the heat of the sun. This lattice provides a handy home for nesting birds and as such the second floor windows of our villa are a haven for many fledgling baby birds. The first day we were here, we opened our large dining room glass door, with it’s incredible panoramic view onto the valley floor below, and there on the terra cotta tile was a little fledgling bird, a ‘renna’ . He seemed to be okay but was a little stunned. As soon as I turned my back, another one appeared, this one much less developed and not moving at all. Over the course of the day the kids made up a little nest out of a container and a towel and carried the wee birds with them on their adventures. 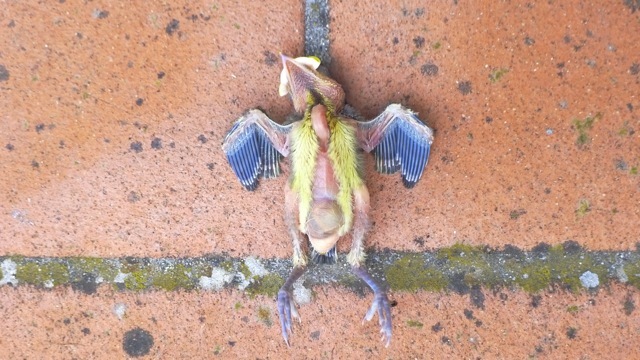 By late afternoon, we returned to find yet another juvenile bird laying dead on the tiles. I tried to feed the more robust one later on in the day, but during the course of the night they both died. The next afternoon we returned from our walk into town to find three dead brids on the grass just beyond the tiles. I wonder how many are instore for us today? It seems that must need to breed like rabbits if they hope to have any of them survive into adulthood!